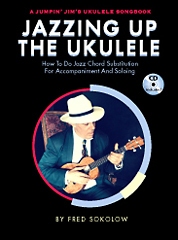 Fred Sokolow's Jazzing Up The Ukulele is a fun and practical method book/CD for uke players who want to add jazz chord substitution principles to their arrangements. Using 7 classic jazz tunes, Fred teaches this by: 1) Comparing a simple chord arrangement to a jazzed-up version. 2) Explaining how all the variations work. 3) Presenting a chord/melody solo to learn for each song. Everything is written out in uke tablature, and all three versions of each song are on the enclosed CD. Plus, the opening chapter clearly introduces the music theory that is the foundation of playing chord substitutions. Songs include: “Back Home In Indiana,” “Look For The Silver Lining,” “Avalon,” “April Showers” and “I’m Always Chasing Rainbows.” Check out the Jukebox on this site to hear the three versions of "Back Home In Indiana." A Jumpin’ Jim’s Ukulele Songbook.